It's a milestone! 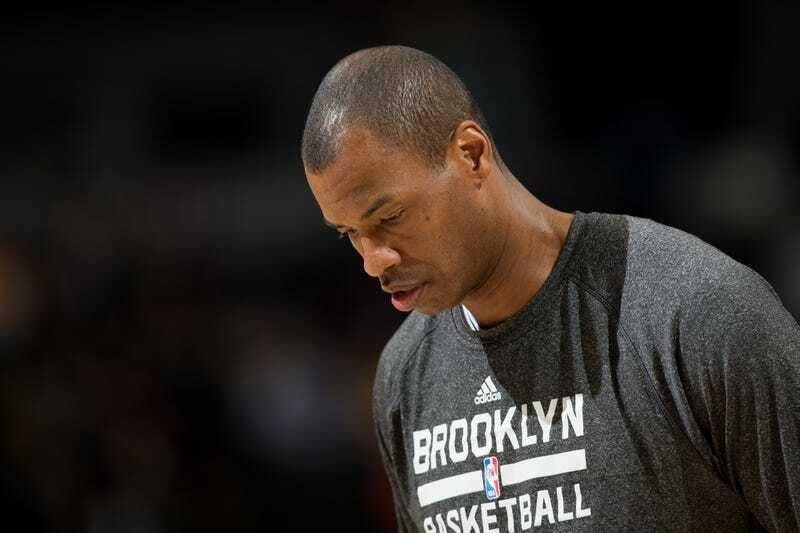 Sure, there have been plenty of closeted gay players who have retired, but until Jason Collins's announcement this morning, there had never been an openly gay player who retired after it became clear that no one wanted to sign him. "Hey Jason … Jason! How come we never see you with any women? Are you gay?" The team bus was uncomfortably silent. Everybody from the front of the bus to the back heard the question. It wasn't the first time something like this had happened. In sports, guys bust each other's balls all the time. I had been asked that question a few different times by teammates in my previous years in the league, but this time was different. Whenever guys would go out on the town on road trips, I always had a built-in excuse—a trip to a local casino or a visit to a family friend or a college buddy in that city who I had to go see. Sometimes those friends were real. Sometimes I made them up and would sit alone in the hotel watching TV while the guys went out to enjoy the nightlife. It was a lonely experience, even when I was around other people. It was always mentally draining, because I always had to be on, 24/7. Whenever I went out to dinner with teammates, I became especially skilled at steering any conversation away from the personal and back to the realm of sports or entertainment. After a while, guys just know you as the vet who loves to talk basketball. When you go to a new team, you have to create that character all over again. "I think you're gay, dude." An unnamed teammate defused that situation by vouching for Collins's heterosexuality, declaring that he had seen Collins out with a girl. Collins says he still thinks about that moment. His message to everyone reading this is simple: help out like that teammate did. This scenario plays out every single day on buses, school cafeterias, and office buildings across the world. Maybe 10 closeted athletes will come out and be free over the next year. Or maybe not. People ask me all the time, "Don't you think we need more athletes to come out?" Yes, of course I do; that would be great. However, if we really want to make the world a better place, we also need more people like the teammate who saw me drowning and threw me a lifeline. You can be that person who speaks up. Collins's account also functions almost as a sequel, filling in everything that happened over the year and a half since he came out. It began with a message of encouragement from from an unlikely source: former NBA player Tim Hardaway, who in 2007 declared he "hates gay people," but has since done a complete 180, even rallying for marriage equality. I was coming out of a boot-camp workout in LA a few days after the Sports Illustrated article published when I got a call from a number I didn't recognize. It was a 305 area code. I thought, who the hell is calling me from Miami? "Hey, this is Tim Hardaway," the voice said. He said, "I just want to tell you that I'm really proud of you, man. You have my support." Tim may never know just how much that meant to me. That was major. In that moment, I knew that it was possible for a person to change in their heart and mind. If Tim supported me, I knew there would be others that did as well. Collins goes out of his way to thank Jason Kidd, Kevin Garnett, and random fans who would recognize him on the streets of New York, all of whom provided kind words. He also thanks the Nets media staff for their hard work in those furious first few weeks with the team—but notes that the attention died out pretty quickly. He says once the novelty of being a gay player wore off, nobody cared about a random bench guy getting eight minutes a night. "The much-ballyhooed media blitz to cover me unscrambled so quickly," he writes in SI, "that a flack jokingly nicknamed me Mr. Irrelevant." And that's probably Collins's legacy: that no one really cared after a while. He got a ton of attention when he came out, a ton more when he signed, but when a guy averages a point and a board in eight minutes off the bench, people stop caring about who he wants to sleep with. And now he's just another 35-year-old fringe player, failing to catch on with a team in the summer and unwilling to put in the work to stay in shape on the off-chance an opportunity opens up midseason. Because he was first, he gets multiple "I'm retiring" first-person stories; the next gay player won't.